Greg Abbott To Texas Voters : "Punch One and Be Done"
HOUSTON, Texas — Attorney General Greg Abbott encouraged a standing-room only gathering of the Kingwood Texas Tea Party to “Punch One and be done.” The candidate for Governor met with the patriots on Monday night, the first day of early voting. He encouraged the voters to vote straight-ticket Republican. Abbott laid out his initiatives but said “the real message was that Barack Obama operatives were trying to turn Texas into Obama’s image.” He told the crowd that “Obama’s community organizers are doing a comprehensive job of organizing” and asked them to take 5 voters to the polls with them. Abbott said “Obama has lied to you, and the United States Supreme Court has ruled against his Administration 13 times. We need a President that will follow the U.S. Constitution.” The crowd cheered when he reminded them that he had sued the federal government over 31 times as Texas Attorney General. He vowed to continue to fight the battle against Texas’ Voter ID law saying he believes voter fraud is real and must be stopped. He said he “will appeal for as long as it takes” to overturn the decision of the judge who ruled against the law nine days before early voting. The Obama appointee enjoined the law from being used during the election but the Fifth Circuit Court of Appeals stayed the decision. 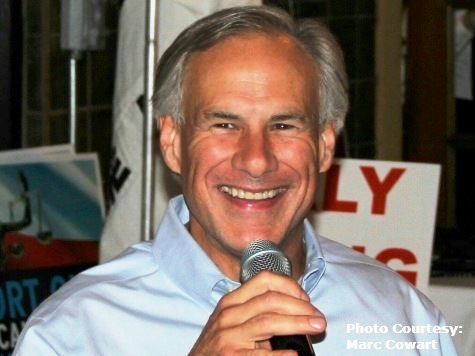 Abbott has defended the Ten Commandments monument that sits on the grounds of the State Capital, and he has challenged Obamacare with other state Attorney Generals. He said he “intends to restore the Doctor/Patient relationship and get rid of D.C. bureaucrats.” At his helm, the child support system has become number one in the nation. One of his initiatives is to keep government small by amending the Texas Constitution to keep the budget from grower faster than population growth plus inflation. He said he will keep Texas No. 1 in creating jobs. He will look for ways to return tax dollars from the surplus to voters. Abbott has a 100 page plan for education. Cecilia, his wife of 33 years, is a former teacher and school principal. He said that “education has gotten off the pathway.” He wants to return education to local control and give school boards the right to opt out of key parts of the education code. He said “he would end Common Core, and drive a stake through the heart of CSCOPE.” Davis voted to increase taxes, and she has refused to tell how much her education plan will cost (10 billion). The gubernatorial candidate said “I will secure our border, this is not just talk, I have a detailed plan.” Abbott asked for help with the legislature to put 500 troopers and 20 more Texas Rangers on the border. He also wants to create anti-corruption and anti-gang taskforces, pass tougher anti-smuggling laws, protect the borders against cartels, and enforce the rule of law. Abbott warned that “Wendy Davis is the twin of Barack Obama” and “Texans do not want the next four years to be like the last six years.” He said Davis has voted against the Second Amendment right to bear arms and voted against keeping God in the pledge. By contrast, Abbott has challenged Houston Mayor Annise Parker and promises to fight for pastors’ First Amendment rights. The City of Houston has subpoenaed sermons, notes, and written communications with congregants in the case involving the Houston Equal Rights Ordinance. Abbott warned that Battleground Texas and the Democrats “have Obama’s Finance Director, Deputy Campaign Manager, and Harry Reed’s spokesman.” He said their game plan is to make Texas a more fertile ground for Hillary Clinton or Elizabeth Warren to run for President.